As a patent infringement suit filed by Bose against Beats looms, the longstanding retail partnership between Apple and Bose may be coming to an end, with a new report claiming that the premium audio products will be removed from Apple's retail locations. Citing a "reliable source," MacRumors reported on Friday that instructions are to be sent to employees soon on how to begin changing over inventory starting next week. The change will apparently see the removal of all Bose audio products from Apple Stores, affecting both store shelves as well as demo units coupled with iOS and Mac hardware. Apple and Bose now compete in the premium-priced audio market, after the company bought Beats Electronics for $3 billion back in May. Like Bose, Beats also makes headphones and speaker systems. 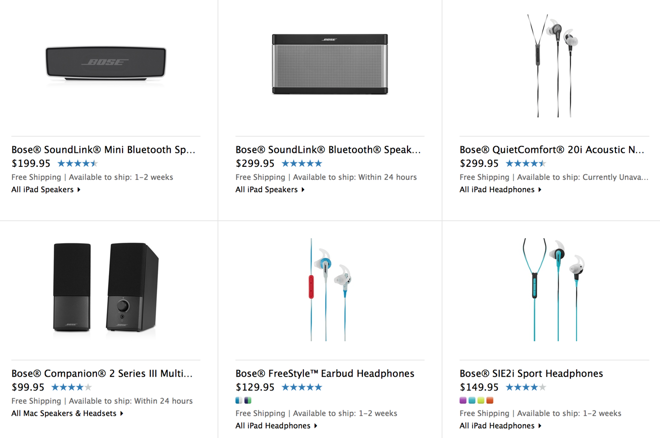 Apple's online store currently lists a total of 17 Bose products, including a range of SoundLink Bluetooth speakers, and the company's popular QuietComfort series of noise-canceling headphones. It's that same noise-canceling technology that prompted Bose Corporation to file a patent lawsuit against Beats in July. Specifically, Bose has accused the Beats "Studio" and "Studio Wireless," which are advertised to feature "Adaptive Noise Cancellation," of infringing on its patents. Bose asserts to the court that "Beats knows or is willfully blind to the fact that" its products are infringing on its patents. Bose has been selling its QuietComfort branded headphones with this technology since 2000. For the latest "QuietComfort 20" headphones, Bose says they are protected by U.S. Patent Nos. 6,717,537; 8,073,150; 8,073,151; 8,054,992; and 8,345,888. The rumored move by Apple also comes as its Beats brand has been barred by the National Football League. The NFL doesn't allow its players to promote unsponsored products, and Bose is the official audio partner of the league. The issue came to a head this week, after it was revealed that the NFL fined San Francisco 49ers quarterback Colin Kaepernick $10,000 for wearing a pair of pink breast cancer awareness-themed Beats headphones at a press conference last Sunday. NFL rules restrict players from endorsing unapproved products when conducting interviews, including 90 minutes following the end of a game. 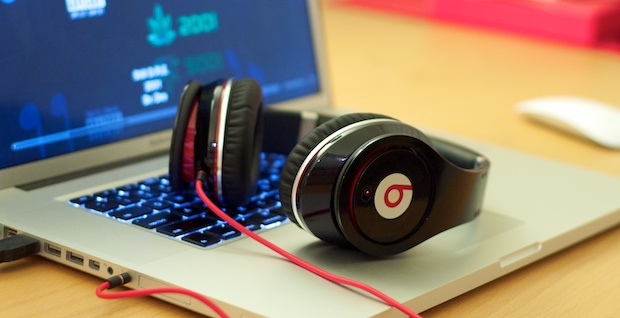 Beats headphones have already been given a prominent position in Apple's retail stores since the purchase was announced, spotlighting headphones and speakers from the popular brand.